Water polluted by the Sanchi oil tanker may reach coral reefs in the Ryukyu Island chain, according to the latest ocean model simulation by scientists from the National Oceanography Centre (NOC) and the University of Southampton, using the leading edge, high-resolution global ocean circulation model, NEMO. 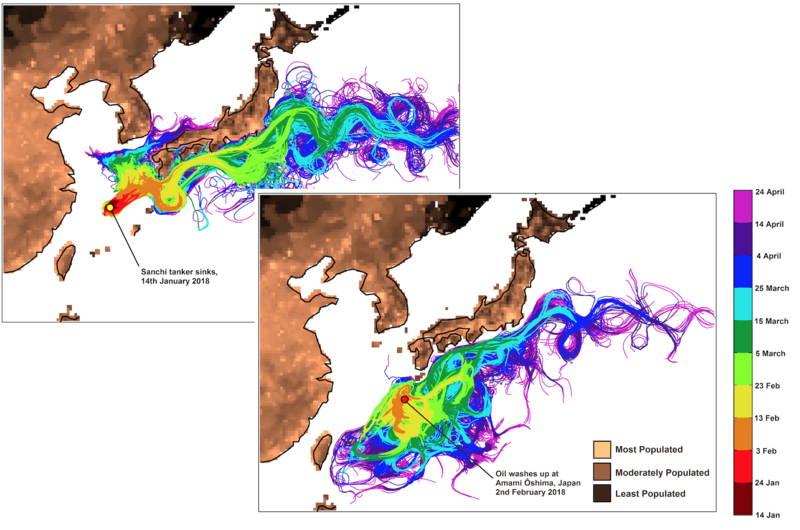 Previously, simulations by the same team of scientists were based on the Sanchi oil tanker’s final resting site, and found the proximity of the oil to the major Kuroshio Current significantly increased the potential area affected by the spill, including the Greater Tokyo Area hundreds of miles away. They also predicted that the island of Amami-Oshima, home to 73,000 people as well as coral reefs, would be threatened by oil contamination approximately 20-30 days after the Sanchi sank. Now, after only 20 days, oil contamination has reached the island and prompted these revised projections. The NEMO ocean model is supported by UK National Capability funding from the Natural Environment Research Council (NERC). This model is widely used by both UK and international groups for research into ocean circulation, climate and marine ecosystems, and operationally as part of the UK Met Office’s weather forecasting.